What came first, the egg or the chicken? In our case it was the chicken. We have ten of the twelve we originally started with. 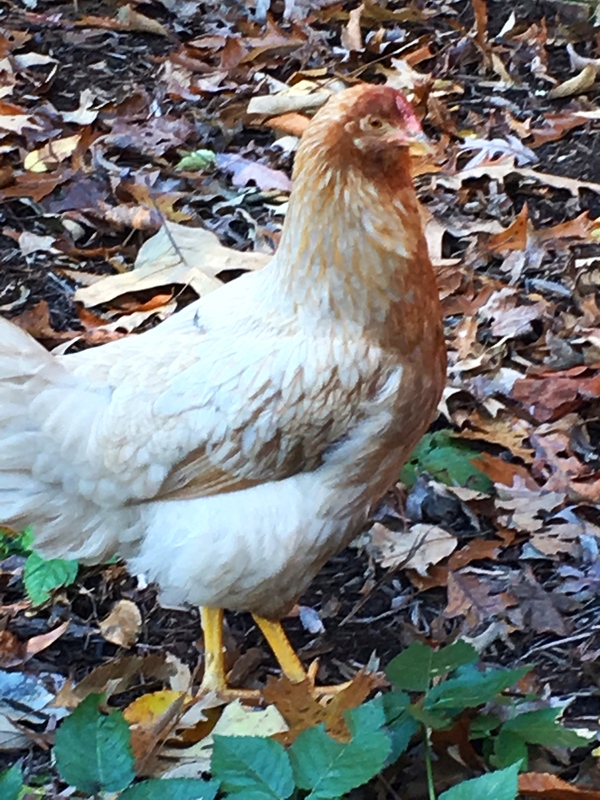 Shortly said, we had one chicken that developed a cross beak and she was unable to eat enough to sustain life and she went to chicken Heaven. Bea was very friendly and sweet as could be. You can see a short video of her looking for me on Instagram here. This is Bea, her beak is obliviously crossed here. She was born normal but as she aged it became worse and worse. Then there is Frida. 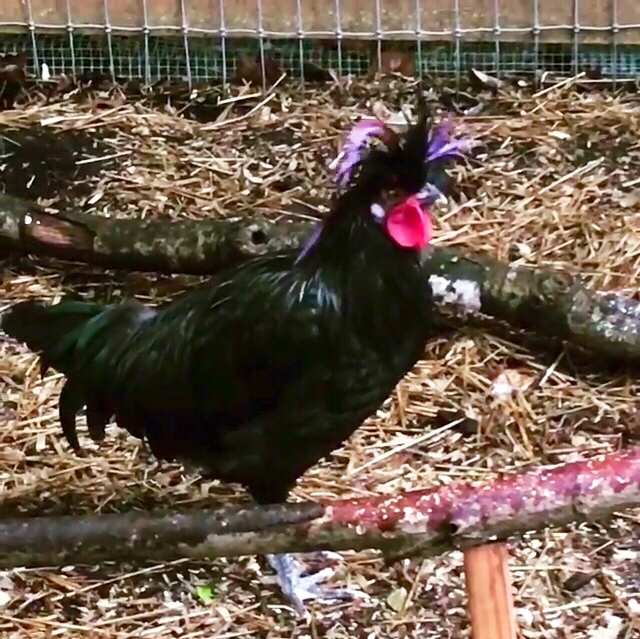 Frida was one of two straight run Polish Crested Chickens we purchased. These were the only straight runs we bought, all others were sexed and determined to be pullets or female. They were an, OMG! they’re so cute, impulse buy. We knew we had a chance of having one and possibly two roosters. But I was optimistic and named one Frida and the other Ester. And, yes, I’ve been told Ester should have an H and it’s spelled ESTHER. Having said that, I don’t care, I have spent my life spelling my name (and the names of our kids) so why not give sweet, little, Ester her own spelling, too? Anyway, I’m telling you about Frida. Frida turned out to be Fred. When I told this to my son, Rick, he asked why I needed to change the name just because the chicken was now known to be a boy? He was right, damn it! Gender equality and self identifying for everyone and I kept referring to him as “her” anyway. SO, Frida the Rooster was hence forth known as the Drag Queen Rooster, Frida! You might note- Frida as some Purple feathers. Well, Frida is all black except for the feathers on the very back of her head, those are white. When the hens weren’t pulling every damn one of the white feathers out! I swear. She looked like a Friar, no pun intended. So I kept spraying the white feathers with a thing called Blue Coat which is an antiseptic for animals. The spray dyes the skin blue and as it happens, white feathers purple. 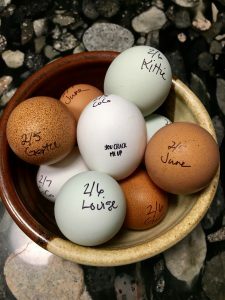 As we moved further into the summer and the chickens were all reaching maturity, eggs were getting laid and Frida was getting frisky. The more Frida matured, the more aggressive she became. That in itself isn’t a bad thing. She protected her flock. Frida gave Cali (one of our dogs) a lesson in messing with chickens 101 and as a result she now has a very healthy respect for chicken personal space. Eventually Frida decided she didn’t like me collecting eggs and started kicking dirt and jumping at me. This continued to progress and I researched how to handle it. In spite of my efforts she became very agressive and even drew some blood from me. It seemed she was destined to go live on a farm somewhere. 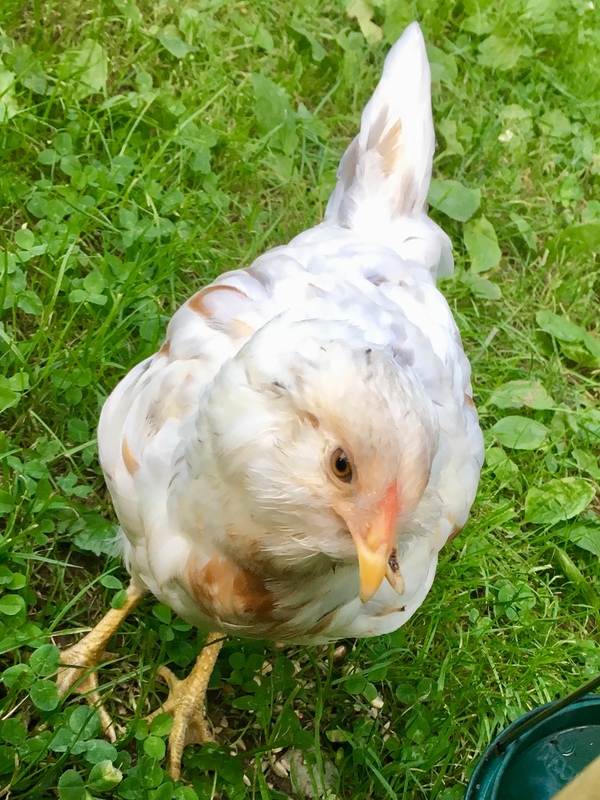 So Chuck listed Frida on the Williamsburg Trash and Treasure FB Group and someone called and said he would like Frida, he was hoping to cross breed with his hens and see what interesting mixes a Polish Crested would bring to his farm. Off Frida went. And peace reigned in the run again. That’s how we ended up here, months later with a Broody Hen and no fertilized eggs for her to hatch. Instead she has been spending the better part of two months sitting in nesting boxes whether they actually had any eggs or not. She has long since stopped laying herself, which is too bad because she lays pretty blue eggs. She is one of two True Blue Whitings we have and her name is Louise. She is a pretty yellow and golden brown and very sweet. I removed her from the nesting box several times each day and at night to put her on a roost. She never stays out long. Today. Today I took drastic measures. It’s a brisk 55 degrees and sunny. After spending lots of time debating on different ideas I decided to take the plunge, well for Louise to take the plunge actually. 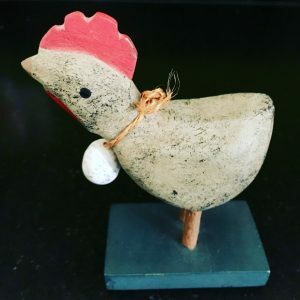 It is recommended to but a broody chicken in cold water with the thought that this will lower their body temperature (which is elevated when the go Broody.) I put her in a big bucket of cold water and held her there for 4 minutes. At first she was very unhappy but quickly relaxed and waited it out. Once I released her she ran off and spent quite a long time preening herself and fluffing all her feathers as they dried. I also decided to “lock” her out of the chicken run all day in hopes the colder day would aid in the cooling of her temperature. Since the gate is shut I have had to play gate keeper to the hens in order for the other hens to have access to the nesting boxes, since they are still laying. I haves pent the better part of the day outside or looking out windows to see who is trying to get in the run. And unfortunately Lou has been up there more than I had hoped. I keep chasing her off and she goes but reluctantly. Maybe I should have kept my Attack Drag Queen Rooster and let her hatch some. Maybe next time I’ll ask Stephanie to purchase some fertilized eggs from her friend on my behalf. 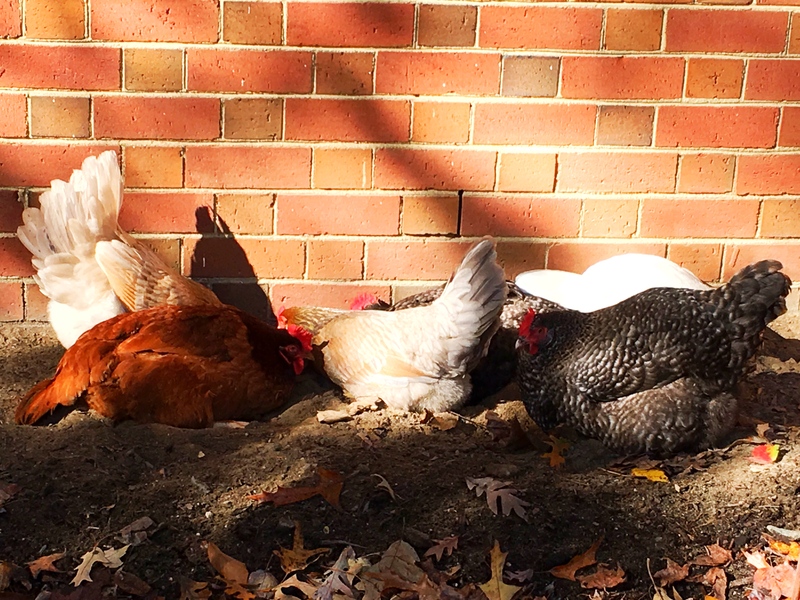 Today is the first sunny day after rain on and off for the last few so the chickens have found a nice sunny, dry spot to take a dust bath. Click this link to watch a couple minute video. If you haven’t seen chickens dust bathing they look rather strange. I find it entertaining and I’m sure you will, too. Update- It worked! Louise is no longer broody!!! If you give a mouse a cookie and all, then if you finish a shawl, you will probably begin a shawl. At least that is what I did. I just finished the Maighdeann-ròin, the Seal Maiden, by Nat Raewulf. 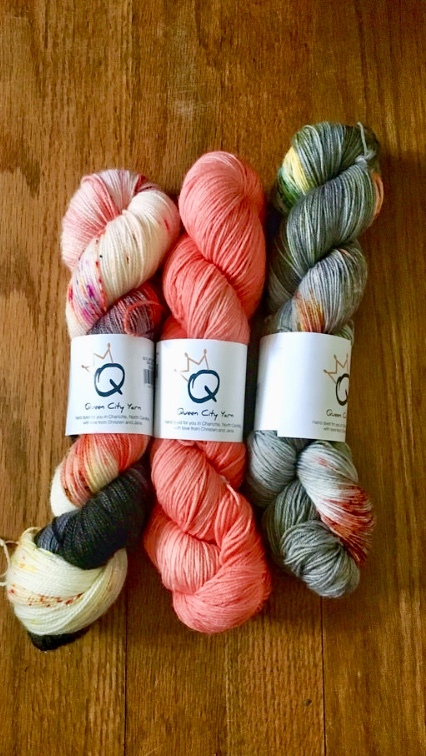 I made my with three colors, one was a lovely salmon pink tonal and the other two both had this color but one was mostly grey with speckles and the other pink, white and black. I typically am a matchy-match girl when it comes to colors so throwing in the mostly grey skein was a bit out of my comfort zone. I should clarify it’s not that it doesn’t match exactly……More that it evokes a different feeling. I’m not really explaining it right. I typically would have chosen a tonal in another solid color. Perhaps it that I would never have put the grey with the black together. I was really drawn into that grey one with how the yellow pops against the pink. And here’s the thing. Now that the shawl is finished I actually really like the grey one better than the black, pink and white skein. So now the odd one out feels like its no longer the grey but instead the black. Funny how that happens. Overall, I really like the finished shawl. I like the way the long tails curly-cue. I so wish I add made the picot edge more pronounced, it seems to need a more substantial defining edge. I used the backwards edge cast on and it wasn’t a good choice. I may go back and remove this and redo it but in reality of taking time to do this I probably will not. I said you finished a shawl, and this was the one, you also will start a shawl. That is this one. It is The River of Dreams by Lauren Rene. 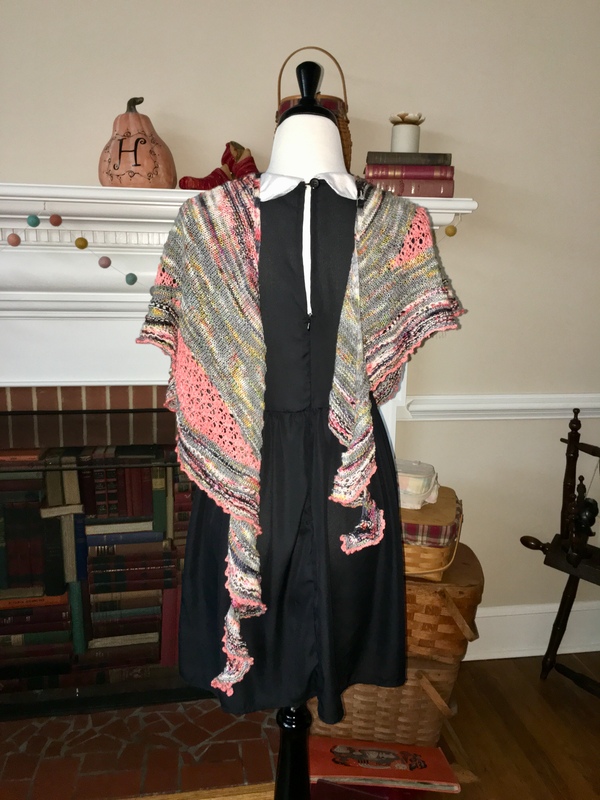 This shawl was specially designed for the LYS store, The Flying Needles, anniversary. 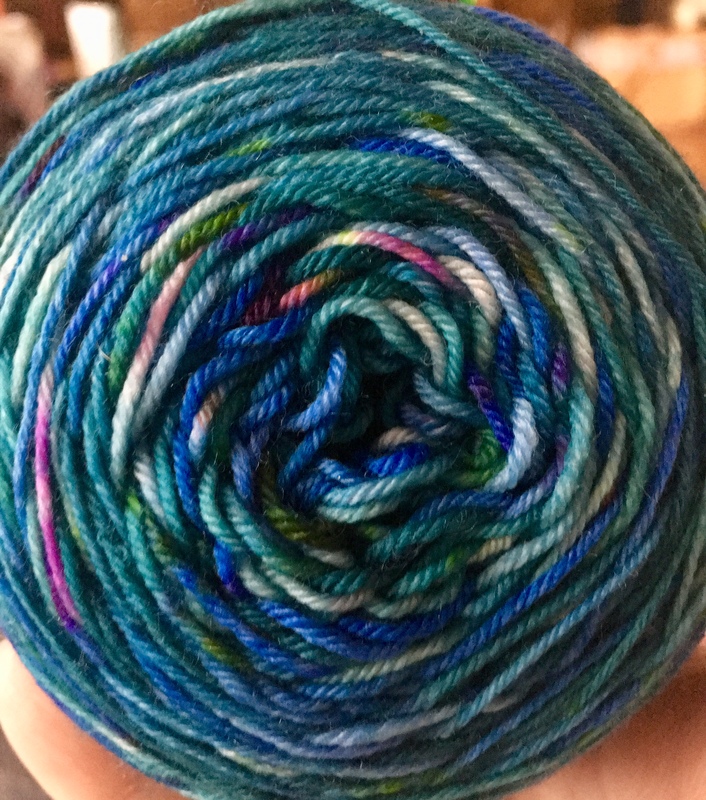 I also got a special color way dyed yarn made just for this shop. 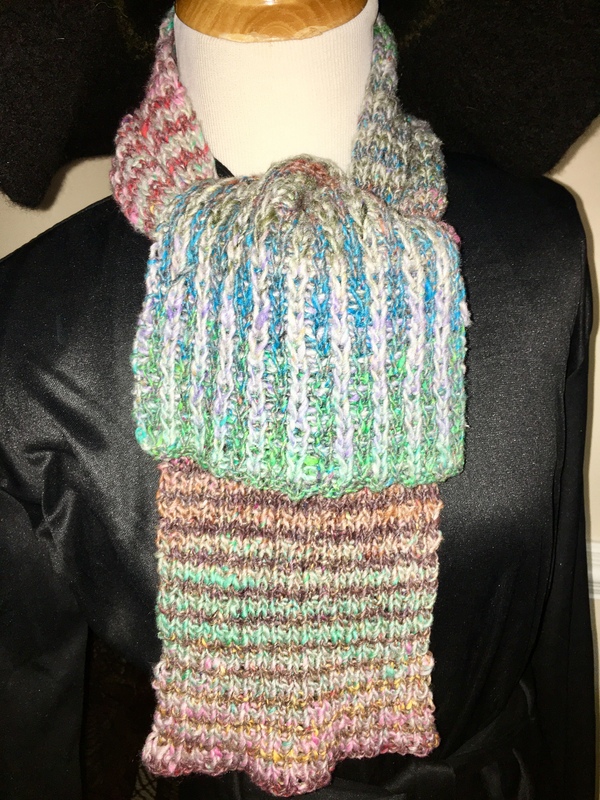 The shawl uses 5 colors. Mine starts with a darker blue-turquoise working through to lighter and lighter turquoise to mostly white. I thought the blues was a nice choice for a shawl with river in the name. 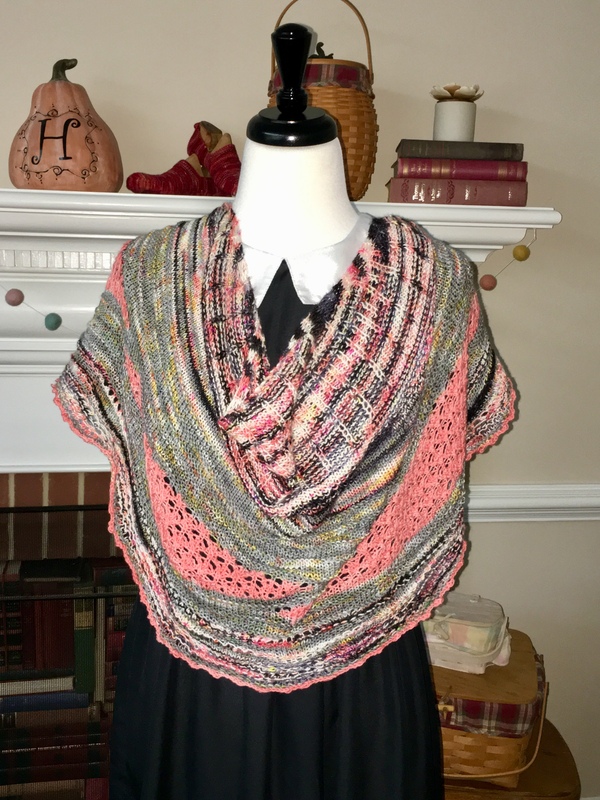 The shawl is a big rectangle with a panel of lace and faux cables. I haven’t made a rectangle shawl in awhile so it will be nice for tv watching as there wont’t be any changes in stitch count. I haven’t shown you a competed picture go my Magic Stripes scarf finished so I’m popping one here. I’m off to knit while we watch some Netflix.